TIRANA, Albania — Members of Albania’s LGBT community on Saturday celebrated the International Day Against Homophobia And Transphobia, the largest anti-discrimination solidarity action in the world with activities taking place in 120 countries. 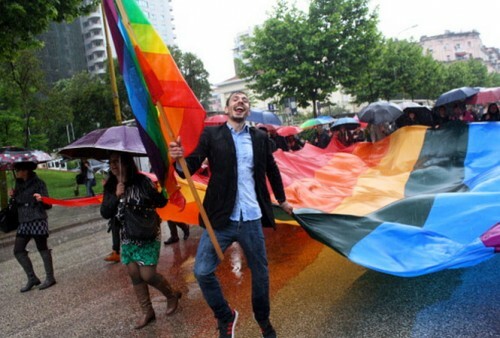 Only in recent years has the LGBT community in Albania emerged from marginalized and underground activities to hold public events and parades, although not entirely without causing controversy and prejudice in this small Balkan nation which until the collapse of the communist regime in 1990 penalized homosexuality. Click here for images from IDAHOT celebrations in: El Salvador, Honduras and the Philippines.